Some months ago a fellow attracted a lot of attention with the coinage “epistemic closure.” The liberals loved the conceit, an allegation that the conservative mind was unalterably closed, sealed off, locked in the past. Actually, I thought it was pretty accurate: that’s WHY I turned right 25 years ago, because I’m schooled in and prefer values that endure. Moreover, the concept cannot but imply its own counter diagnosis, which might be called “epistemic promiscuity,” a pathology from which liberals and liberalism surely suffer. Those folks are obsessed with what’s new, hot, hip, with-it. They abandon ideas, policies and people with frantic abandon, moving ahead to grasp at the new concept on the cutting edge. Oh, how they love to be out front with their flashy, handsome John Edwardses and their Barrack Obamas; not for them the sure, the dowdy, the grimly duty-driven. 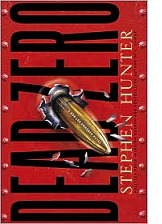 Somehow that conceit became the intellectual center of my new book, Dead Zero, a thriller (lots of gunfights, yes!) in which an administration, a department and an agency become hopelessly enamored of a new thing, in this case an Afghani politician named Ibrahim Zarzi, whom all believe will be Our Man in Kabul. Alas, this belief arrives after a Marine recon battalion, much aggrieved of Zarzi’s actions, has sent a sniper team to dispose of him. The team can’t be recalled; it must be betrayed. One man, a gunnery sergeant of legendary skills, survives the ambush and pushes on. No, his name isn’t Bob Lee Swagger. Swagger is called in when that gunnery sergeant appears in DC six months later, still determined to put Zarzi into the hurt locker. Swagger is recruited by the FBI to consult on the case, actually to run a sniper versus. sniper game on the Sergeant. This Zarzi, meanwhile, is toast of the town, hero of all the soirees, beloved by the media. He looks like Omar Sharif with cosmetic dentistry and carries on like a ’30s movie star. But you know Swagger: he’s a realist. His strength is that, unlike so many in Washington, he sees what is, unfiltered by delusion. He looks at Gunnery Sergeant Ray Cruz and doesn’t see rogue psycho, and he looks at Ibrahim Zarzi and doesn’t see savior of our aspirations. Almost immediately he begins to question the premise of the operation and tries to understand the dynamic of hidden forces at work, even as his exasperated supervisors–Nick Memphis of the Bureau and Susan Okada of the Agency, leading Task Force Sniper–try to control him. Where is this going? It goes toward violence of the modern kind, fast, lethal, abrupt and high tech. And that’s when it’s best to have a guy like Swagger around, because he’s a man who can handle the rough stuff. I hope the book satisfies at the narrative level. That’s the fun part. I hope it provokes at the cerebral level; that’s the important part. Hunter’s novels never disappoint. Order your copy today at Amazon.